Have a question or comment? Send us a message below! How do I contact BBJ? You may contact us by phone, email, or chat seven days a week. Our knowledgeable customer service team is available weekdays until 10 PM CST and weekends until 5 PM CST at 800-592-2414. Ordering from BBJ is simple. You may order in person, online with our easy checkout process, by chat, or email at any time. Not a Problem! Changes, reductions, or cancellations must be made before the deadline date and time on listed on your contract. Additions to an order may be made at any time, additional charges may apply if expedited shipping is required. Cancellations may be made before the deadline date listed on your contract. We do not have minimums for linen orders. Charger orders under 25 plates require a ground shipping fee of $25. Shipping charges vary by shipping location, weight and type of service. We normally ship via ground service with UPS. We can use expedited service or alternative carriers if necessary, to meet the required receipt date. Your order will arrive on or before the receipt date listed on your contract. We aim to have orders delivered two business days prior to your event. Orders which require expedited shipping may have a different timeline. Most orders will arrive via UPS ground service and/or by BBJ owned truck. Other delivery options are available for special circumstances such as last minute or international orders. Please make sure the shipping location on your contract can accept deliveries. Orders can be picked up at any of our showrooms nationwide. Shipping charges will apply to orders picked up outside of our headquarters in Niles, Illinois. We request that you schedule a pickup of BBJ products the business day following your event. There are return instructions included with each order to help you with this process. Provided with your rental order are the return duffel bags and boxes with pre-paid return labels. Make sure to have the linen counted, packaged, and sent back using the enclosed prepaid UPS return label on the first business day following your event. The packaged linen can either be delivered to the nearest UPS office, or you can call 1-800-823-7459 to schedule a pick up at the location of your choosing. Local pick and delivery is available in some locations. How do I pack my order for return? Linen is simply placed in the return duffel bags sent with your order. Just be sure it is free of food, floral, or miscellaneous debris. Chargers must be rinsed and repackaged in the original shipping method to prevent breakage. Please return them to BBJ immediately. Make sure linen is returned free of any food, floral or other miscellaneous debris. What do I do if I have lost my UPS return label or BBJ return duffel bags? What happens if my order is not returned on time? You may be subject to a late return charge. If there are any delays in returning orders, please contact the Return Service Department directly at 1-800-592-2414. May I combine different orders in the same return package? We prefer returns use the prepaid return label issued to a specific contract, but if necessary, it is acceptable to combine different orders. What happens if something has been lost or damaged? Upon return, all products are counted and inspected by BBJ using state-of-the-art electronic systems. You will be charged the replacement cost of all missing items or damaged items. You will not be charged for stains that occur under normal usage. However, you will be charged if stains occur from improper usage such as using linen to mop floors. 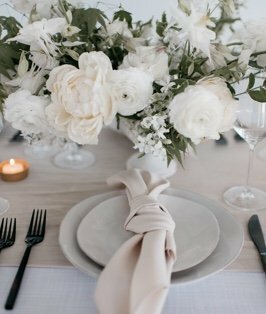 To help avoid damage, before packing tablecloths for return, make sure to remove any food, floral or other miscellaneous debris and rinse all charger plates. Do you provide set up and/or tear down (aka production, installation, night pick up or strike) services? BBJ regularly provides production services in most metropolitan areas of the US. We have experienced decor specialists who install table linen and add special finishing touches to your table linen installation. Our team can also pack and pick up items at the end of the event, taking care of the return for you. Fees for BBJ production services will be provided prior to the event. Production service fees are subject to revision if the final function specifications are changed. Contact our team for price quotes and additional information. You may order complimentary fabric swatches through our team in person, by phone, email or chat, and online. Swatches are free of charge and are sent via USPS; if you need swatches expedited, shipping fees will apply. Full-sized sample linen may be ordered at the usual rental rates.